How many different varieties of rice can you think of? How about different peas? If you are like most people you will probably be able to name a dozen types of rice and maybe half a dozen types of peas. Would you be surprised to learn that there are over 100,000 varieties of rice, of which 40,000 are cultivated varieties and that Thomas Jefferson cultivated over 20 varieties of peas at Monticello? So, why is it that when we go to the grocery we typically find such a small selection of produce and meats when there could be more? The answer is simple. Our food supply has been dumbed down to the few varieties that are cheap to produce, easy to transport and have the longest shelf life. As a result, our culinary tastes have also been dumbed down and the dishes that we ate just 100 years ago do not have the same taste today because we have substituted inferior varieties of produce and other ingredients. We went On the Road in April to one of our favorite cities, Charleston, South Carolina, to speak with a chef that is committed to bringing back our heritage foods with their rich and unique flavors. Every visit to Charleston is filled with fabulous food, great chefs and inspiring stories. This time was no exception and perhaps, our most memorable. 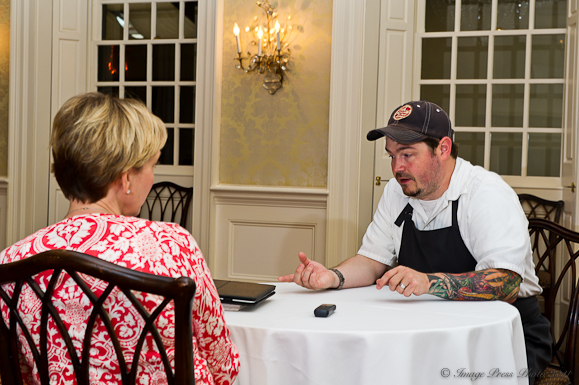 Chef Sean Brock, of McCrady’s and Husk fame in Charleston, is also the recipient of the 2010 James Beard Best Chef Southeast award. In addition to other awards, numerous articles in magazines and newspapers, television appearances and participating in events like Atlanta Food and Wine, Chef Brock is writing a book. He is incredibly busy, to say the least. Born and raised in the South, Brock is proud of his heritage and Southern food. He was raised on a farm and spent days as a boy shucking corn or shelling peas. Some say that he is the best farmer to ever become a chef. Passionate describes every chef and farmer that we have met since we started our travels, but Brock may be taking that word to a new level in his mission to fix what has been broken in the way our foods are grown and raised. 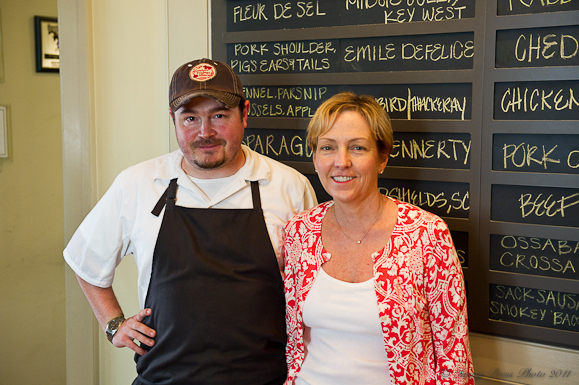 Brock, a graduate of Johnson and Wales, initially came to Charleston for culinary school in 1997. 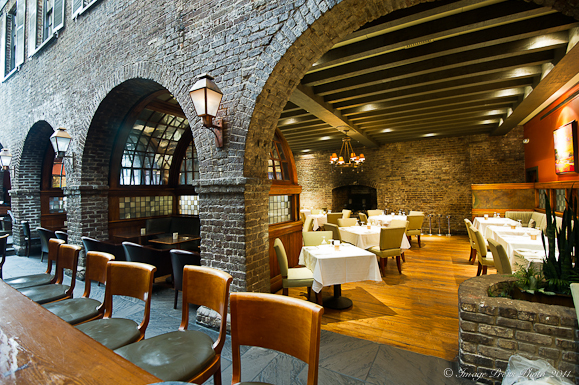 He began his career at Peninsula Grill in Charleston. 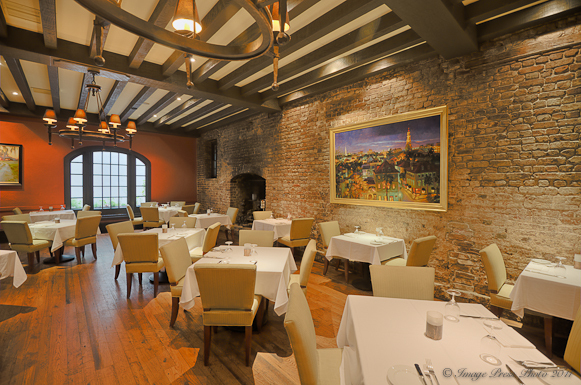 After working in several other restaurants in other cities (The Hermitage Hotel in Nashville, Tennessee, Lemaire in Richmond, Virginia, and La Terraza del Casino in Madrid), Brock came back to Charleston five years ago as Executive Chef at McCrady’s. It was this transition that was a life changing experience for him. 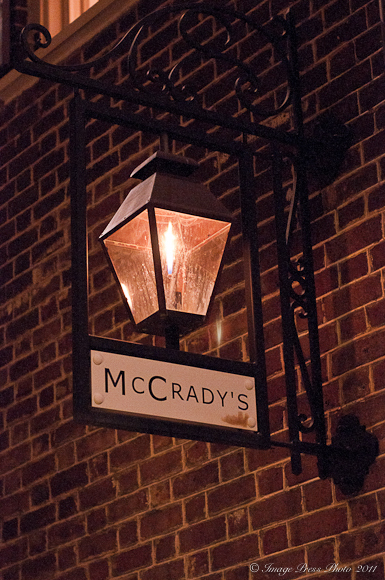 Once known as McCrady’s Tavern (originally owned by Edward McCrady), this historic building dates back to 1788. It was a local tavern along with a brothel upstairs (at one point) during its history. Back in those days, the building was located right on the waterfront, but over time the land was filled in and now sets back several blocks from the shoreline. There have been many notable patrons of this tavern over its long and colorful history, including George Washington in 1791. It was the historical significance of this building and telling the story about that history that has had the greatest influence on this chef over the last five years. He started to think about the foods that were served in McCrady’s Tavern hundreds of years ago and set out to find the original species of plants that once existed in the region to bring back the true flavor profiles that Charleston is known for. Dishes that were indigenous to the area like Shrimp and Grits, She Crab Soup, Hoppin’ John and Oyster Benne Stew now tasted nothing like they did. Local rices, produce and beans used in these dishes disappeared in the 1930‘s. Over time, genetically engineered rices, dried beans and seafood from cheaper sources took their place. Brock felt a responsibility as a chef to do something about it. Inspired by others, he started to grow heirloom varieties of plants that belonged in Charleston’s kitchens on his own farm. He sourced other heritage products, such as meats and poultry, to bring back the flavors that Charleston enjoyed hundreds of years ago. We make Hoppin’ John every New Year’s Day as well. How cool that you tried it with the local varietals! I’m sure it was well worth it! This is a really interesting piece – I love Chef Brock’s use of heirloom seed to grow food that he prepares. Beautiful piece, terrific pictures, thank you! Thank you, Lynn. We had a great visit with Chef Brock and the discussions about our current food situation were truly inspiring. Facinating interview. It’s wonderful seeing more and more chefs with their own farms and gardens, Farmers’ Markets cropping up everywhere, and heirloom varieties more readily available. It makes eating out and cooking at home more interesting, enjoyable, and healthy. And that’s quite a work of art on Chef’s arm! I know you and John appreciate great ingredients and the difference it makes in our cooking. I hope that these interviews make more people aware of the incredible chefs that are out there championing bringing back the heirloom foods that should be available to us. It is what is normal and what is right. A friend of mine works at Husk and has been telling me of how I should make a little culinary trip to SC! After reading this, I definitely want to! Thanks for sharing! Sean Brock is, in my opinion, the best chef on the planet. We ate at McCrady’s Valentine’s Day, 2010 and the menu was spectacular. 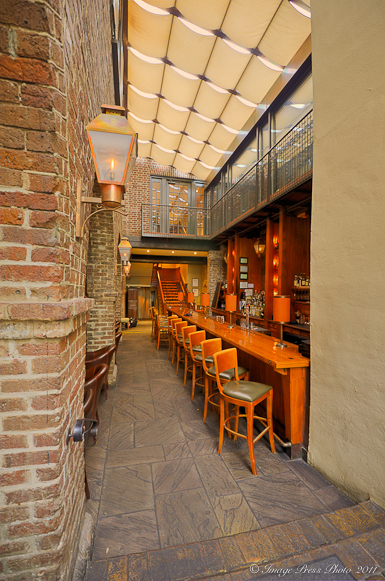 I am dying to get back to Charleston and try Husk. His appreciation for heirlooms, animal treatment and food in general is a lesson for us all, professional chefs and home cooks alike! So great of you Gwen to focus on this chef and the cause of bringing back regional ingredients. Thank you for your comment. I thought you might enjoy this interview. I did come across several theories on the origins of Hoppin’ John and that was one of them. I guess we will never know how it really happened, but when made with Carolina Gold Rice and Sea Island Red Peas, I am glad that someone created the dish! What an interesting interview. It is so refreshing to hear of someone with such a passion for bringing back our “heritage” food products. I have been saying for years that our foods just don’t taste like they used to and it’s entirely because of the mass production and marketing of easily produced inferior products. I grew up on a farm where we had our own chickens, cows and pigs along with a large garden every years. Sadly, I no longer have access to those local products. Even many of the local “produce stands” and farmers markets aren’t really selling locally produced goods. We just happen to be going to Charleston this weekend. Guess where we’ll be dining? Thank you so much for your thoughtful comment. I totally agree. and yes, unfortunately, the Farmer’s Markets are not all selling locally sourced produce. Our food is so bland now that we are having to use more spices and salt just to get any flavor from the dishes. It is so sad that no one knows how food is really supposed to taste. Some of the best meals we have had are made with locally sourced produce and humanely raised animals. It tastes like food should and doesn’t need all the extra seasonings. What a wonderful and educational review about a topic that is so dear to my heart. I’m ordering the rice and beans right now! Thanks, Gwen! I love the Anson Mills site–thanks for the link. I just ordered a ton of goodies to bake with. Yum! I finally made it to Charleston for the first time in March. Amazing! I can’t wait to go back. 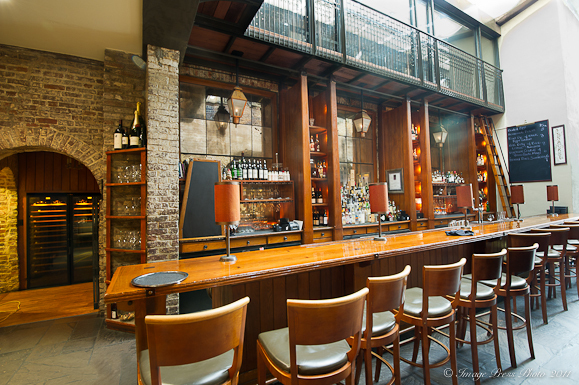 I was able to take a culinary tour and while we didn’t go to Husk, we did hear all about it. Excellent interview and photos! Gives me even more reason to return. I agree that we’ve been dumbed down with that’s mass produced. I had to travel to Ojai to taste the most beautiful strawberries I’ve ever tasted… because they were so delicate they’d never make the drive down to where I live. I also had a dream last night that the RGB was open, and were raising chickens both for eggs and for meat that were serving right back in the bistro. By the sounds of this interview, that is quite possible, yes?! How about doing another On the Road tour to this place so I can come along this time?! Making my hoppin’ John right now. The beans smell amazing. I love how little and perfect they are. The verdict? The best Hoppin’ John we’ve ever tasted. Please tell Chef we loved it, and thank you for sharing. It’s well worth ordering the ingredients you recommended to have a sample of the rich, original flavors. We have given up so much, and it’s great to bring it back. Oh what a wonderful write-up! I love Husk, and make a point of eating there every time I’m in Charleston. So wonderful to see this as I plan my next Charleston trip!